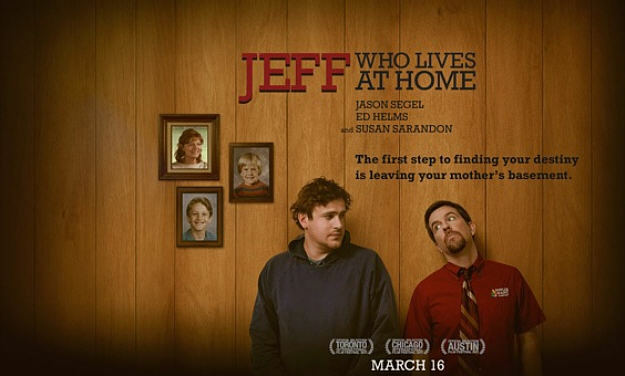 Jeff Who Lives At Home is a comedy movie about two brothers, who are dealing with their own personal issues. Jeff (Jason Segel) is one of the brothers who is a slacker and still lives at home with his mom. His brother Pat (Ed Helms) a salesman who is having a mid-life crisis and buys a new sports car without telling his wife (Judy Greer). Their mother (Susan Sarandon) is dealing with “where she went wrong” in raising her two boys. Together, Jeff and Pat will confront their issues and discover themselves. The film played at the 2011 Toronto International Film Festival and its release date in theaters is March 16,2012. Comments for Here’s the trailer from the movie Jeff Who Lives At Home are now closed.